The MAIN ENTRY to the park, closest to the epicenter of activity, is near the parking lot of Hope Community Academy. Use Google maps to search 720 Payne Avenue for directions from your location. Look for signs to find the tunnel that "goes down the rabbit hole!" and descends into the magical world that is Swede Hollow Park. P The EAST ENTRY, which is what you find when you google/map directions to "Swede Hollow Park", has a limited parking lot and on street parking and you must descent 150 steps into this lush, hidden valley. A cool entry, but not for the unfit. P The SOUTH ENTRY is a smaller lot at the intersection of E7th and Payne Avenue. It is a longer but beautiful walk from there to the north end of the park. 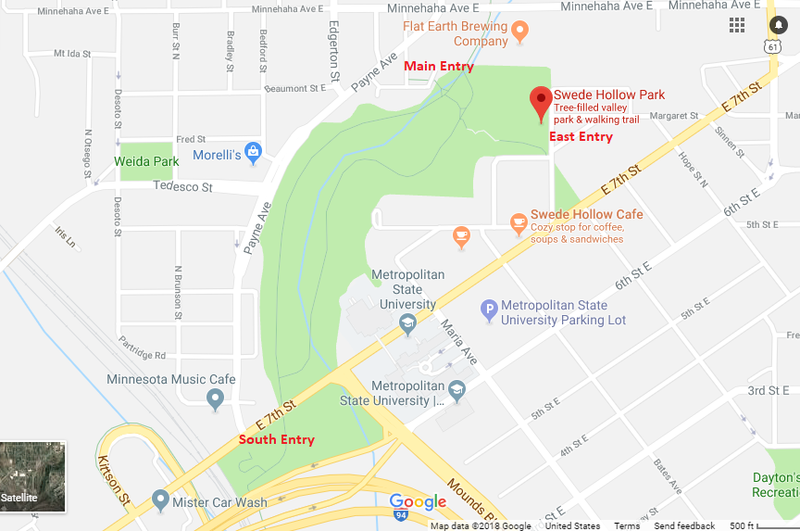 P The NORTH ENTRY, off this map, is at East Side Heritage Park, at the intersection of Phalen Boulevard and Arcade Street. There is a sizeable parking area there. BIKE ACCESS: The burgundy line is the Bruce Vento Bike Trail, an excellent way to get to and around at the festival. Click on this LINK for a map of the trails. P The MAIN ENTRY to the park, closest to the epicenter of activity, is near the parking lot of Hope Community Academy. Google map 720 Payne Avenue for directions from your location. Look for signs to find the tunnel that "goes down the rabbit hole!" and descends into the magical world that is Swede Hollow Park.